Robben and Schweinsteiger: both are fantastic footballers, and they were both early when it comes to wearing compression socks during soccer. Although we saw surprised reactions in the beginning, this trend spread among more and more football players and big clubs. And that's certainly not unjustified. You can benefit from compression socks during almost everything you do in a day. But especially for sports that are very sensitive to injuries, you better prepare as well as possible! 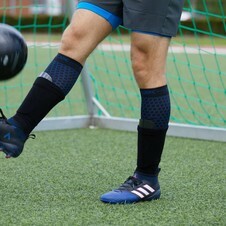 Why are football socks with compression indispensable for every football player? You will read it here. Football players must be able to draw short quick sprints, so they can quickly make an action or be at least as fast as the opponent. Strong leg muscles are therefore a must for football players: you're using them constantly. They help you not only to run fast, but also to jump high. This way you can be ahead of your opponent with heading that ball! Of course not only the leg muscles are important. A strong 'core' is also indispensable: you have to be able to turn your upper body quickly and it helps you to stay in balance. This way you are a lot stronger and you don't fall at the slightest nudge. So, during football a huge appeal is made to the leg muscles. As a result you might experience muscle pain in your legs pretty soon, but it can also lead to nasty injuries. Common injuries in football are ankle and knee injuries. Muscle injuries are also common in field football. Field football is the sport with a high risk of injuries: over a fifth of all sports injuries are incurred here. With football, for example, you put a high pressure on your joints. Especially your hip and knee joints get a heavy job. These, like all other joints, are controlled by your muscles. A typical football injury is a twisted ankle: the most common sport injury. The ankle nods, but the stabilizing muscles do not respond quickly enough. That leads to a stabbing pain. A weakened ankle is common in football because your feet often have to make a turning movement. Once you have a swollen ankle, there aren't much other options then to raise your leg, cool it with water or a damp cloth and try to stand on it occasionally. But of course we want to prevent being bothered by those painful injuries! Compression socks provide a decreasing amount of pressure from the ankle to just below the knee. As a result, the blood that has flowed down is pushed up again, stimulating blood circulation. This has many advantages. For example: waste products from your muscles can be drained more easily, reducing the risk of muscle pain. In addition, your muscles get as much oxygen as possible, so you'll feel energetic longer. This way you'll be still faster then your opponent at the end of the second half! 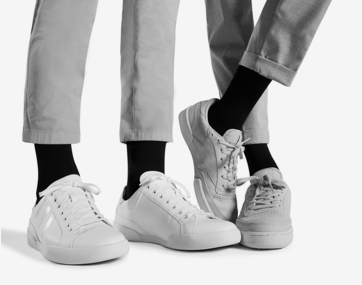 In sports such as soccer, where the ankle is heavily loaded by, among other things, turning, it is important that you give your ankles sufficient support. For both the prevention and treatment of injuries to the ankle, compression socks can provide the necessary support. Just like for example an ankle race or ankle bandage, these socks give compression around the ankle joint. This improves the feeling of stability in the joint. So compression socks really can't be missing in your sports bag! 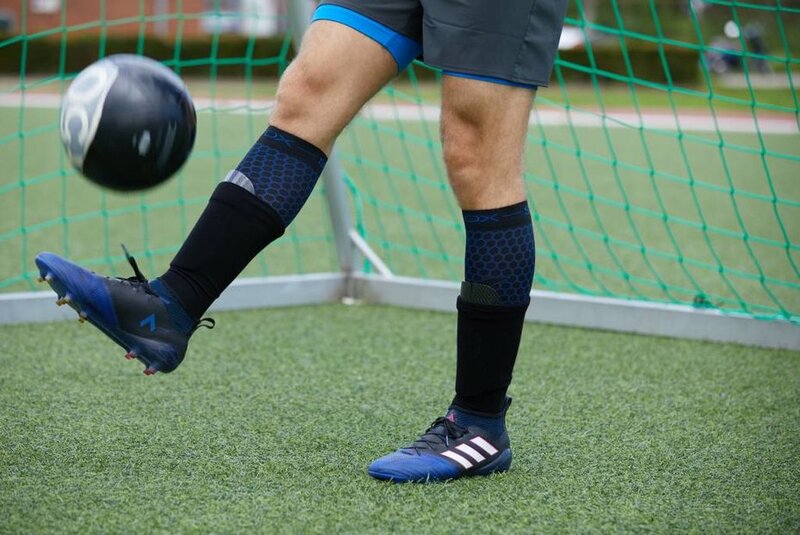 Which compression socks do you need for soccer? Then only the question remains: which socks are suitable for you? In football you wear shin protectors with over them usually the stockings of your club. But there is also room for a thin compression sock! The Football Socks are extra thin, so they fit well under the shin guard (directly on the skin). Also don't try to put them on top of your shin guard, because then you miss the proper functioning and they're too tight for that. The Lightweight Running Socks are also very suitable. They are slightly thinner than the regular Running Socks, which will also fit well under your shin guards and club stockings. And despite the extra layer you do not have to worry about sweaty feet: the compression socks are made of temperature-regulating materials. So you want to be able to kick a ball without injury? 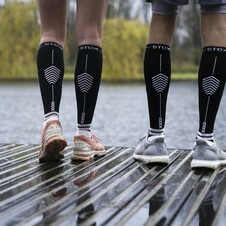 Try the STOX compression socks once.